Another great Boxer soul has gone to Rainbow Bridge. In his passing, I reflect on how privileged I was to have known this great dog and to have used him twice in my breeding program. A son of the great Multi BIS & BISS Am. Ch. Rochil's Grande Marshall SOM LOM (Maxx), who was bred and owned by Sandi & Perry Combest of Rochil Boxers, "little" Max, was breathtaking to watch when he made his return to the ring as a veteran with his new handler, Crystal Tricker. Watching him float around the ring gave me goosebumps and memories I will never forget. As an outstanding producer, Max will live on in his kids, his grandkids and in future generations to come. I feel lucky to have his granddaughter, Can. Ch. CynTech's DashNBy Tornado Ally (Bindy) and his grandson, Can. Ch. CynTech's Mad Dash To Sherwood (Brady) in my home and many of his kids near me as well. Four of his grandkids, including Bindy and Brady, from the one and only litter of Max's beautiful daughter, Can. Ch. CynTech's Ally McBeal DOM (Allie), have become Canadian Champions! I know that "Grandpa" Max is very proud and is shining in each one of them :-) Goodnight sweet Max, we may not see you any longer but we feel your spirit around us and in our hearts. 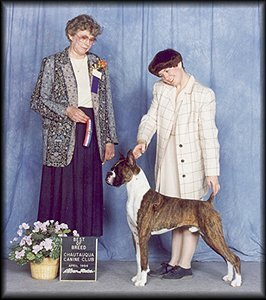 Max was bred and owned by Sharon & Ron Berry (Berlane Boxers Reg'd) of Ardrossan, Alberta, Canada, and was co-owned with Christine Tricker (Tricker Boxers Reg'd) of Caroline, Alberta, Canada. In 1999, Max went to live with Christine, Crystal and Wilf Tricker, who have loved and spoiled him throughout his senior years. You can view more pictures of Max and get more info on him on the Tricker Boxers website as well as on the Berlane Boxers website.